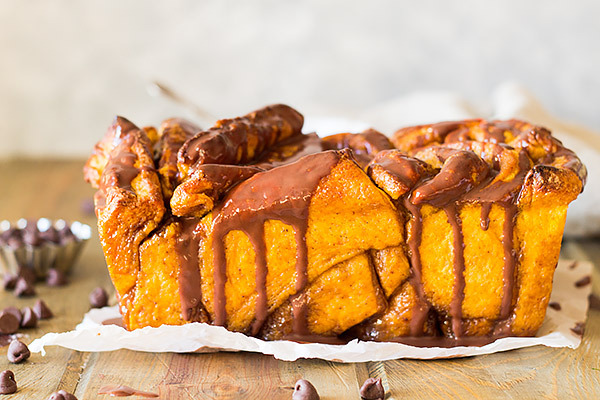 This Pumpkin Pull Apart Bread is filled with warm pumpkin spice, brown sugar and drizzled with a chocolate ganache. It’s super addicting and super good! Can you guys believe we are half way through October already? It wasn’t that long ago and the kiddos started school, where has the time gone? With time flying by as fast as it has, I hope you have been able to squeeze in a little fall baking. 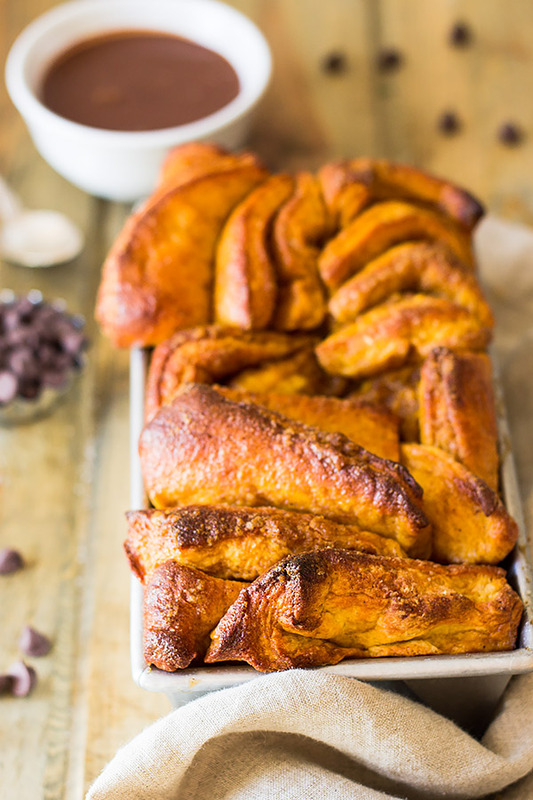 If not, I am demanding that you do and make this pumpkin pull apart bread! I can’t get enough of this bread and neither can my family. We have gone through several loaves already and I plan to make more. Fall and Christmas baking are some of my favorite times! I love all the warm spices that are used and the way it makes the house smell cozy and inviting. 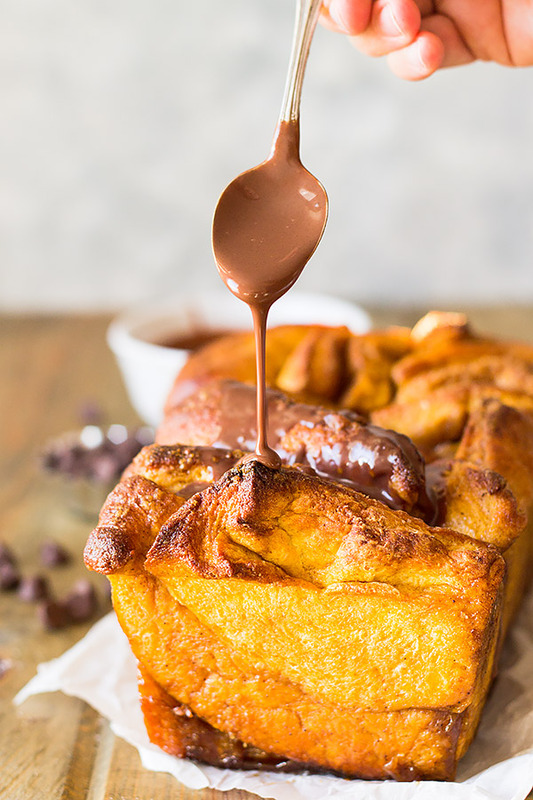 Grease a 8×4 or 9×5 loaf pan and set aside. Turn dough out onto a lightly floured OR greased work surface. Roll dough into a 16×12 inch rectangle with the long side facing you. For the filling combine the brown sugar and the cinnamon in a small bowl. Spread the melted butter over the dough then sprinkle with the brown sugar and cinnamon mixture. Cut dough rectangle vertically into four 12×4 inch strips. Stack the strips then cut five or six 4×2 pieces leaving everything in stacks. Place in prepared pan cut side up. Cover and let rise until almost double. (I let mine rise to the top of the pan then bake) Bake at 350 degrees for 30 minutes or until golden. Cool loaf 10 minutes before removing from pan. Let cool completely before frosting. To make the chocolate ganache bring heavy cream to a boil in a microwave safe bowl. Pour in chocolate chips and let sit for a couple of minutes then stir until smooth. Drizzle over pumpkin bread.